This weeks week was provided to me for free in exchange for an honest review. You may recall I reviewed David Meredith's first book, The Reflections of Queen Snow White, sometime last year (read that review here if you missed it!). 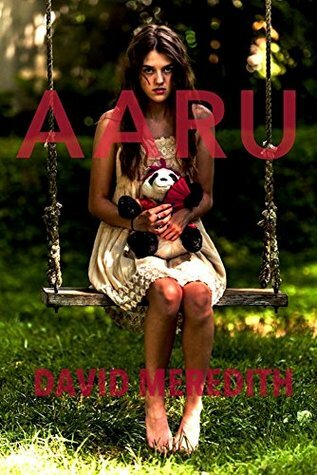 When David reached out to me to read his newest novel, Aaru, I eagerly said yes! Rose Johnson is dying of terminal cancer. Her days are spent bed ridden in a hospital, totally dependent on her nurses for even the most basic of tasks due to her ill state and weakness. Rose has given up hope of a miraculous recovery and wishes to just die in peace, until a strange man, Mr. Adams of Elysian Industries, shows up with a new trial technology that he says, will save her life. At the behest of her sister, Koren, Rose reluctantly agrees to this last ditch effort. What transpires next is groundbreaking. Rose's brain is scanned and uploaded into a computer mainframe, a digital utopia called Aaru. After her physical body dies, Rose is alive and well within Aaru, able to communicate with her family through a computer screen linking the digital afterlife with the world. In order to market the groundbreaking success of this technology, Koren is conscripted to be the official spokesperson for Elysian in promoting Aaru to the public. The sisters quickly realize that things are not quite as perfect as they had initially thought as they find themselves embroiled in a cat and mouse game with a dangerously brilliant nemesis who will stop at nothing to get what he wants. Brilliant book! What most struck me about this book was it's uniqueness. As someone who reads quite a lot of books (hello, I have a book blog this should not come as a surprise to anyone) I have never read one quite like this. The whole concept of a technologically induced life after death was fascinating while at the same time elicited an almost eerie feeling. Sure it all sounds good on paper, but the characters portrayed as residents in Aaru raised some interesting and thoughtful concerns about their existence within the virtual paradise. It was a topic that definitely had me thinking long after putting down the book. David has a very florid type writing style that evokes strong images and feelings. It is easy to find yourself lost in his words which is always a treat to any bookworm. This book certainly had it's fair share of intensity and danger (TW sexual assault), which I feel I should mention, would not be appropriate for younger readers. Much of the last part of the book was uncomfortable for me to read as an adult and seemed almost too graphic for a book I feel seems marketed to a YA crowd? Maybe it's not marketed to that demographic, but I always feel like books with main characters in the teen ages are? Either way, just be aware if you are sensitive to that type of material, this may not be the book for you. Overall, it was a really imaginative and interesting read, I would definitely recommend it to my high-school age and up readers. This is book one of a planned trilogy and I have to say, I am excited to see where the series takes us!